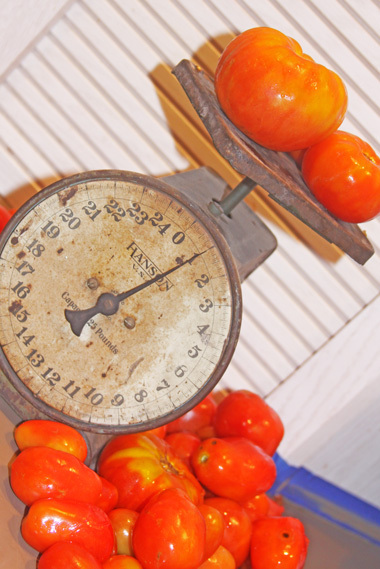 If you grow tomatoes in your garden, there is nothing more rewarding than canning them into delicious canned goods that your family can enjoy all year long! 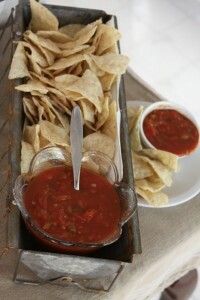 This is my absolute favorite use for my garden tomatoes and our family’s favorite sweet and spicy salsa recipe. This is a salsa recipe that is sweet but packs a slight kick and is a favorite of everyone who tries it! When my brother was in collage his girlfriend (and now his lovely wife) used to have this in her dorm room anytime I visited – she would serve it as a late night snack. She said that her mom always made it for her and that it was a family favorite. It was by far the best salsa that I had ever tasted, and every other store bought or restaurant brand that I tried never quite had what this recipe had. I remember always looking forward to our visits and her mom’s salsa over the years. Almost 10 year later I am so lucky to call her my sister and her mother graciously shared her salsa recipe with me. It is the best salsa out there in my humble opinion! 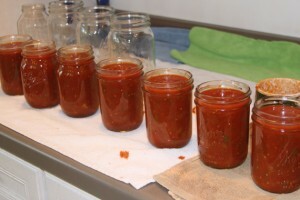 When I started gardening and having enough tomatoes to start canning this was the first thing I ever attempted. It turned out so amazing that it gave me the confidence to start canning all sorts of things, but this is still my favorite. I grow almost all of the vegetables that I need to make this in my garden. Tomatoes, green peppers, and jalapeno peppers. I buy my onions in bulk at a discount grocery store or local farmer’s stand. * This recipe is sweet and somewhat mild with a slight kick. Add more peppers if desired. This has to be made in TWO, five quart pans or you will need to cut the recipe in half. Mix all ingredients except tomato paste and corn starch in a large kettle. Bring to a boil stirring occasionally. Cook until vegetables are tender. Remove about three cups and set it aside to cool. When cool, mix in corn starch and tomato paste. 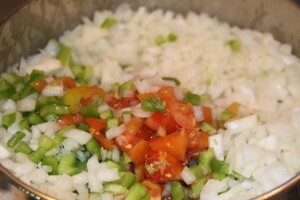 Bring to a boil and then gradually stir this mixture into the rest of the sauce stirring constantly. Bring to a rolling boil and pour into hot sterilized jars and seal. To sterilize jars: Place jars in a large pot of boiling water - leave for about 2 minutes. Use tongs to remove and set aside to cool on an old towel (in case salsa spills in the process). When ready to can, boil water in a small pan, and place jar lids and caps in for about 30 seconds to a minute. After jar is filled to 1/2 inch below the rim, take out rim, wipe jar top clean, screw cover into place until the first bit of tension. After jar "pops" in about 30 minutes or more, screw on tightly. The lid will have an indention in the center when sealed. We love this served super cold from the fridge in my aged galvanized chicken feeder! It is a really cute way to serve up something made with love at a party. I have tried a few variations to this recipe. *To cut out calories and sugar I have substituted Splenda and I think it turns out just as good. 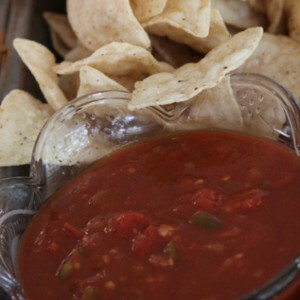 *My husband loves spicy so for a hot version of this salsa I use half red pepper and half ground red cayenne pepper. 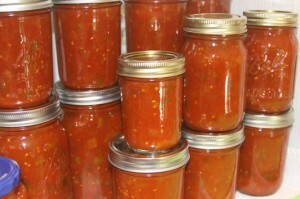 This is a pretty simple and straightforward recipe and not too difficult of a canning process. I am no canning expert, so before you attempt canning for the first time make sure that you know the rules and how to can safely! 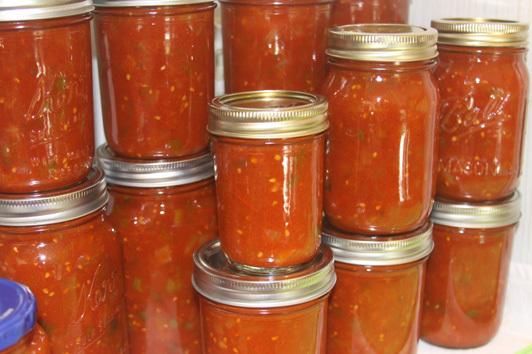 For the last four summers I have been making this sweet salsa and we always eat every last jar of it before the next summer. I now make about 4 batches of this each year and give it as gifts throughout the year, as well as serve it up at just about every get together that we attend! I love adding it to gift baskets with a raffia bow, a cute label with the kid’s picture on it and a bag of tortilla chips! I call it The Bond’s Sweet Summer Salsa and love that the kid’s helped grow all of the veggies to make it. 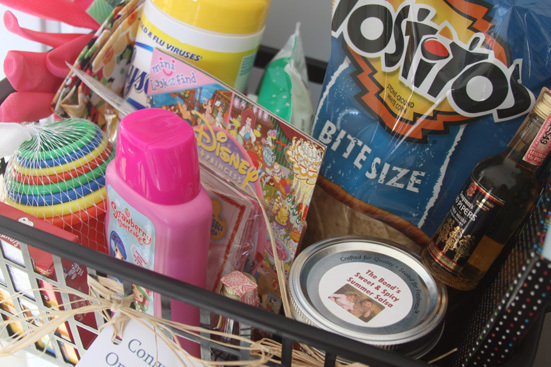 It is the perfect treat to add to housewarming gifts, birthday or Christmas gifts, or just a nice thing to stop and share with people that you love!